There is music that tries to include everything. There is music that through a kind of mental erasure, eliminates things, like a stone block is chiseled away to reveal an image somehow already there inside, or like a completed drawing that is then subjected to selective erasing to create new form. Michael Byron, composer of radical tonal music which is not minimalist because the repetition is not the point, writes subtractive music in a way. It is music that creates melody by the intersection of the parts, by making the background come to the front, by creating something not reducible to someone writing melody and harmony on a piano and then taking pieces of that result and assigning them to instruments. Or if he does compose at the keyboard (I have no idea) it is in the realization of the parts that the music comes about, that it sounds, not as much before. That's how I am thinking of his music as I listen to the three chamber work collection Music of Nights Without Moon or Pearl (Cold Blue 0002). The first two works interrelate and most closely adhere to the idea of foreground-subtraction as I impressionistically experience it. They do so by virtue of being performed by a mid-sized chamber group, the Calarts New Chamber Players, consisting of two violins, viola, cello, contrabass, two pianos and synthesizer, all conducted by David Rosenboom. The title piece works in blocks of sound--the pizzicato strings working on harmonically related tonal-melody fragments with a loose pulsation. The synthesizer comes in at angular intervals with a block chord related to the harmony of the strings. The periodicity of its continual sounding and resting has a pulsation that is not in the same ratio as the strings. Finally the two pianos enter with a strummed chord that is rhythmically closer to the pulse of the strings, and as the piece progresses becomes increasingly frequent. In the on-the-surface structurally simple three-section articulations the end effect is of a continually percolating tonality fascinating to hear, with the listening ear taking it all in and at the same time hearing melody come forward as we hold our attention to one or more voices at any point. Finally the piano strums become ever more insistent, then all but disappear to return more quietly as the ear focuses more on strings and synth in the end. The related work that follows, "Invisible 'Seeds' for James Tenney", has a sectional approach as well. The strings play a sustained arco of tonal-related elements in a progression that contains latent melody in its movement. The pianos punctuate throughout with staccato chords in a somewhat random, irregular pattern that nonetheless works as contrast to the sustained strings. It is in a way a slow movement in contrast to the end-pieces. The two quite sustained, semi-pastoral mood works set the listener up for a considerably less locked-in chromatic-diatonicism in the final piece. "Entrances" features David Rosenboom on overdubbed multiple (4) pianos working to create an all-over, harmonically complex turbulence that at first almost sounds like something Cecil Taylor would be after in some of his mid-to-later solo works for piano. Yet in the end the music evolves so that motival kernels work off of each other to create a more collaged sweep that increasingly emphasizes more-and-more certain motives. It is a literal phantasmagoria of swirling sound. Perhaps the idea of a subtractive method is not complete without the additive opposite. After all Maestro Byron is in each case combining x, y and z together in interactions over time. But then it's the effect of the listener mentally creating melody out of the fragments in place of the typical through-composed work that more or less hands it to the listener ready made, that's where you can think of it subtractively. No matter. The melody could also be thought of as cubistic--refracted and broken into different bits as a cubist artist might handle an image. The point is that the disk gives us three fascinating aural montages that please without managing to fit into any of the pre-ordained structures of pre-modernism, modernism or minimalism. And of course what matters is that all three resulting works are rewarding and fascinating to hear. In an interview made available in the later '60s, on a now long-unavailable German anthology of the New York school of composers, Morton Feldman (1926-87) remarked that in the early years composing in New York what most helped him was the "complete indifference" of the audiences. "They had no energy even to boo or hiss," he added. This he thought was the ideal environment to grow as a composer. Grow he most certainly did over the years, to become a stylistic universe of one in a scene of leaders and followers. You can get a pretty good idea of the movement of his music over time in the newly released 2-CD anthology Patterns in a Chromatic Field, Music for Cello (Brilliant Classics 9401). The budget set features the cello of Marco Simonacci and the piano of Giancarlo Simonacci. Several sopranos and a French horn player augment the lineup for a couple of short pieces. It's a sort of retrospective of Feldman's work from 1948 through 1981, with a disk and a quarter devoted to his later masterpiece that bears the title of the set, "Patterns in a Chromatic Field". The way from beginning to end holds much fascination for anyone interested in Feldman's development from High Modernist to "Feldmanist". With the beginnings we have two very brief unpublished works from 1948 that show him firmly within the language of the moderns. From there we see a very gradual evolvement into the various facets of the quiet, inimitable Feldman way. "Projection 1" (1950), "Four Songs to Poems by e e cummings" (1951) "Intersection 4" (1953), "Two Instruments" (1958), "Durations 2" (1960), and "Voices and Cello" (1973) get worthy readings before we are launched into the lengthy and monumental "Patterns". 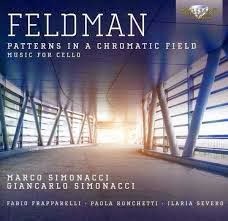 Of course concentrating on the repertoire for solo cello, and cello & piano--with the brief additions of vocals and horn--does mean that certain aspects of Feldman's middle and later music are not representable, such as the hauntingly quiet largess of "Rothko Chapel", but such things are inevitable. This is the small chamber ensemble side of his music, after all, and we cannot expect larger forced styles to be represented. The long, later-period work "Patterns in a Chromatic Field " (1981) takes up the final 90 minutes of the set, but it is such a capstone work in Feldman's oeuvre that one does not feel its temporal weight as much as revel in the unravelling, so to say. It is surely one his later masterpieces. Quiet, yes, uncanny like his earlier mature works, but structurally in a new Feldman zone, like his earlier works related to the high modern "mainstream" but at the same time apart from it, totally Feldmanesque. The liners to this disk mention Feldman's fascination with the oriental carpets of Anatolia. They are woven of patterns that do not follow the perfect symmetry of their more well-known Persian, etc., equivalents, but rather fill the space in a more randomly executed way. His later work has something of that. There is repetition, yes, but the cello and piano parts include variations, a-temporal and temporal correspondences and shifts in velocity that lay out in a way more intuitive than rigorously structured, at least to my ears. It is highly distinctive, highly beautiful music. The Simonacci's do the music total justice. There have been other versions of this work available but of the ones I have heard none sound better. And of course the mini-retrospective of works that span his career offers another reason why this one would be my choice--not to mention the budget price. To have these very engaging earlier works lead up to the "Patterns" opus gives you something, too, that the others do not, which is a temporal context for his final phase and a feeling for his development as one of America's most remarkable composers. It's landmark music. It's a landmark release. If you love the sound of early music played by flute and lute, Ronn McFarlane & Mindy Rosenfeld's Nine Notes that Shook the World (Sono Luminus 92169 CD & Blu-Ray) will doubtless appeal greatly. Ronn McFarlane plays Renaissance and Baroque lutes, Mindy Rosenfeld Renaissance, Baroque and Celtic flutes, fifes, harp and bagpipe for a program of 16th through 18th century works by composers anonymous, folk and established composers of the age. There is fine artistry from the duo. The original instruments and their charming sound and the broad spectrum of works on this disk set (which comes as a standard stereo mix on CD and 5:1 on a Blu-Ray) gives you a quite lovely window on the past. Music by Dowland, Bach, Handel, Boismortier and Locatelli match up with no-less intriguing folk airs from England, Scotland, Ireland and Brittany. The sonic transitions afforded via the various flutes, fifes, harp and bagpipes by Ms. Rosenfeld alters the sonority from piece-to-piece, as does Ronn McFarland's sound on the various period lutes. The two work together as one, turning in performances that delight my ears. Such a journey back in time satisfies; the sound exhilarates. Get this one and revel in Euro-roots as if on a time machine. Anyone familiar with the development of modern music from the '70s on knows something of the arrival of the "ECM Sound", that is of the development of a kind of jazz that had special melodic and spatial qualities that Manfred Eicher and his artists created gradually but definitively. As time went on ECM got involved in classical music as well, at first through the more classical endeavors of its jazz artists, notably Keith Jarrett and Terje Rypdal among others, then with classical music per se, ancient and modern. It wasn't long before ECM had a stable of classical composers that were strongly associated with the label and epitomized what an "ECM sound" could be in the concert zone. Steve Reich comes to mind, of course, who was with the label during a seminal period of his development. And then there is Greek composer Eleni Karaindrou, who continues the ECM association with her latest, Medea (ECM B0019877-02). 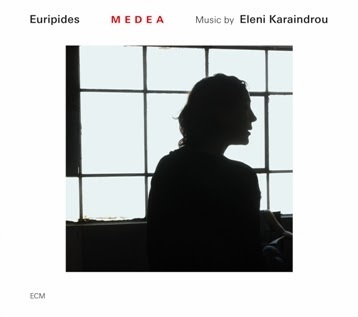 This is music created for the Medea production put on by stage director Antonis Antypas, as performed at the Ancient Theatre of Epidaurus. The Medea enacted there is Giorgos Cheimonas' adaptation from the original Euripides version of the play. Musically it has a timeless, exotic quality. Eleni Karaindrou utilizes a 15-member chorus; Eleni herself effectively contributes a solo part. Plus there is an 8-member chamber group with strong Greek and Eastern Mediterranean associations. The ensemble consists of three clarinets, ney, a player of the Constantinople lute (sounding much like an oud) and lyra, then cello, the santour, and the bendir. With these means Ms. Karaindrou creates a music of great evocative beauty, with its ancient scales and traditional instruments providing sound color and spatial punctuation, the vocals from chorus and soloists extending the sound and all-in-all creating a through-composed modern ambient pomo sort of work that is very identifiably Karaindrou-esque. Even in the purely instrumental passages the reflective, haunting melodiousness of Karaindrou comes through. It sounds less like "authentic" ancient Greek-Eastern Mediterranean music as the idea of that as filtered by an "authentic" Eleni Karaindrou sensibility. And it is one of her very strongest works at that. The performances are excellent, the sound all you'd expect from ECM. It is music that doesn't quite categorize easily, as is nearly always the case with Eleni's works. This is her music and it belongs in the ECM orbit for the stunning sonic qualities and melodic unforgettableness that are nearly always the case where she is concerned. Bravo! Put yourself inside the new--inside the ancient. Hear this one, definitely. Repeatedly. 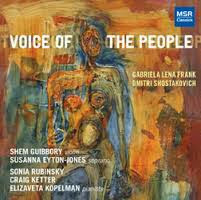 Voice of the People, Gabriela Lena Frank, Dmitri Shostakovich, Shem Guibbory, etc. When you encounter a CD release that makes you pause, that grows majestically before your ears the more you listen, you go away from it glad to have had the chance to open up alongside the music's flowering, and look forward to hearing it many times again. Today's album has that quality in abundance. It has been out for several years but has lost none of the sheen of the new and notable. I refer to a three-work disk, The Voice of the People (MSR Classics 1344). It features the work of two composers from widely disparate backgrounds, yet when performed together in one program, come together to create a satisfying wholeness. Gabriela Lena Frank is represented by two works. She encompasses multiple-heritages which she brings out in her music; she was born in Berkeley, California; her mother is of Peruvian-Chinese descent; her father of Lithuanian-Jewish heritage. "Suenos de Chambri: Snapshots for an Andean Album" (2002) joins the stunning artistry of violinist Shem Guibbory with the considerable interpretive talents of pianist Sonia Rubinsky. The music is based on photographs of a vanishing traditional Peru by Martin Chambi. It occupies a space influenced understandably by Peruvian folk-vernacular, expressively melodic, filled with personally characteristic touches and dramatic flourishes. The work is both modern and timeless, the latter in its backward glance at musical roots; the former in its transformation to very idiomatic Frank. "Cuatro Canciones Andinas" (1999) is a four-part song cycle with text by Jose Maria Arguedas. Soprano Susanna Eyton-Jones handles the extraordinarily expressive vocal part with directness and poise. Craig Ketter brings considerable sensitivity to the piano part. Dmitri Shostakovich's later masterpiece, the "Sonata for Violin and Piano, op. 134" (1968), gets a extraordinarily focused and intensive interpretation by Shem Guibbory and Elizaveta Kopelman. This is music of the kind of sublimity that is in every sense the product of a master after long years successfully finding a voice, reaching a titan-height peak and achieving considerably inimitable profundity, communing directly with his muse with nothing standing in the way. The album is a triumph surely for Shem Guibbory, whose performances glow magnificently, for Susanna Eyton-Jones, who combines drama with a very nuanced delivery, and for the three pianists, who each in his own way achieves artistic completeness. Finally this is Gabriela Lena Frank and Dmitri Shostakovich performed with deeply committed artistry. I don't believe I've ever heard a more intensely realized op. 134. And Ms. Frank comes through with clarity and brilliance. Today's CD of piano music seems like a new age item if you look at the cover. It isn't. 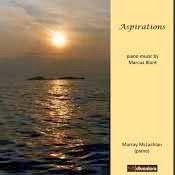 It is a collection of selected piano works of one Marcus Blunt, as played by Murray McLachlan (Diversions ddv 24148). There are 9 compositions/sets of compositions written between 1967 and 2006. Blunt writes pieces that often have an introspective quality. The music is not quite romantic; the mode is often chromatic with definite tonality but in the stretched, early modern sense. You can hear the influence of Scriabin, but not directly. It's somehow beyond that into today. Blunt works within an expanded palette that doesn't show the mystical agitation of the Russian composer, but instead goes its own way in a rhapsodic, mostly quietly reflective manner. Murray McLachlan brings out the nuances and mood of the pieces nicely. It is recommended for those who want something refreshed yet familiar somehow. Good music! There are recordings that affirm. 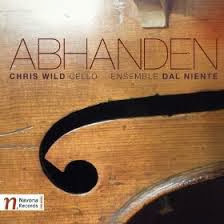 One of them is Abhanden (Navona 5940), a compendium of six contemporary modern compositions played by Chris Wild on the cello with the Ensemble Dal Niente. It affirms a number of things. One is the centrality of the virtuoso solo cello in contemporary works; the other is the continued viability of more-or-less high modernism today. Each work has its own character. The constant is Chris Wild as a cellist committed to new music with the talent to pull together sound-oriented passages with surety, and a singing, expressive way as needed. As one expects on Navona releases, the composers are mostly new names not known to the majority of modern-leaning listeners out there. Yet the music convinces on many levels, each depending on the piece at hand. My favorite probably is the opening "Spiral" by Chinary Ung, who hails from Cambodia. On this one Chris is joined by piano and percussion for music that has a distinct Southeast Asian tonality but spatially-rhythmically takes more of a modern, fanfare-ish approach that I find extraordinarily effective. Claude Vivier's "Piece Pour Violincelle et Piano" has an expressive way with dynamic contrasts, extended cello techniques, and a quasi-impressionist refraction of sound put into an extended modern tonality. Daniel Dehaan's "If it Encounters the Animal, it Becomes Animalized" and Marcos Balter's "Memoria" are both for unaccompanied cello. The former makes use of extended contemporary sound generation in a sort of ping-pong-for-one jagged abstraction; the latter relies more on sustained rapidly bowed harmonics and multiple stops for a more kinetically mobile sound sculpture. Andrew Greenwald's "Jeku (II)" brings the cello together with the violin (J. Austin Wulliman) for a slowly pointillistic exchange of exotic sound techniques that are at times strident but always adventurist, too, so that you cannot predict what will happen when and the subsequent sound-event moments are filled with continual, pleasing surprises. The concluding "Ich Bin Der Welt Abhanden Gekommen" by Eliza Brown brings in soprano Amanda DeBoer Bartlett for a lyrical but expressively strident mood. Bartlett sings quite evocatively as more or less the straight melodist while Chris's cello sounds unusually articulated multiple stops that provide a fascinating harmonic backdrop in contrast with the punctuated spice of dissonance he is called upon to articulate periodically. It is very moving and, as it and the rest of the album confirms, shows the pervasive excellence of Chris Wild and ensemble members along with a nicely contrasting set of well-conceived compositions. This one is a winner! Calling all modernists. 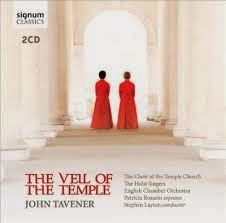 John Tavener, The Veil of the Temple, The Choir of the Temple Church, etc. The present-day John Tavener passed away last November, but not before leaving behind a body of significant works, in later years taking on a mystical, religious tenor when he converted to Catholicism and then joined the Christian Orthodox Church. He was at best known originally for being the first (and only?) modern classical composer to sign with the Beatles' Apple Records, recording the well-received work for voices and orchestra, The Whale. He gradually turned away from modernism to embrace a mostly tonal yet innovative stance in the post- realm. The Veil of the Temple (Signum Classics 367 2-CDs) is certainly his most ambitious, in its original version to be performed all night into the morning hours at the Temple Church (built 1185-1240) in London, a replica of the church built in Jerusalem. The performance heard on the CD was recorded at the Temple in a concert version lasting several hours. The score calls for the massed Choir of the Temple Church and the Holst Singers, the church organ, soloist soprano Patricia Rozario, and the English Chamber Orchestra, all under the direction of Richard Layton. Towards the end of his life Tavener came to believe that all organized religion had a similar mission and objective, though he remained with the Orthodox Church. This work was meant in part as a bridge from Christianity to Islam and the principal organized world religions. It includes liturgical elements of Christianity as well as those of other faiths. Musically it combines chant structures influenced by Orthodox versions, early Roman elements as well as Vedic and other forms. In the end it is a complicated series of solo chant, unison chant, orthodox forms, polyphony and chordal harmonies in addition to special sonic events achieved by voices and instruments. It is in all one very involved ritual experience that the liner notes explain in depth. Even in the condensed version there are a great deal of contrasting uses of aural space that at one and the same time are both archaic and neo-modern. If you know John Tavener's later work it fits in with what he was doing at the foundations, but is much more involved in the articulation of its many parts. It is at times a work of great beauty, at other times a work of stunning ritual sustain, both at times spare and at other times incredibly full. The performances are heart-felt and inspired. You can't help feeling that this is the work John Tavener wanted to leave as his last testament, his final musical utterance, though there are several works that followed this? Either way it is a stunning achievement that opens up a firmament of sound for us to contemplate. Some recordings are so unusual they almost defy ordinary description. And perhaps that's also because on another dreary snowy morning my concentration is flagging. I will begin afresh. Michael Finnissy has done something I cannot recall having been attempted before. Edvard Grieg (1843-1907) completed around 250 bars of a Piano Quintet in B flat major in 1892. For some reason that was as far as he got. Finnissy fell into the mood and structure of those existent beginnings and did two things with them. 1. He completed the Quintet along lines that Grieg might have taken, and 2. 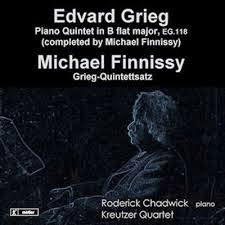 He took the 250 bars and wrote another work "Grieg-Quintettsatz" which did not attempt to stay within Grieg's world, but rather captured Finnissy's reaction to it. Both pieces have been recorded by Roderick Chadwick, piano, and the Kreutzer Quartet. The results are out on CD (Metier msv28541). First off I should say that those first 250 bars make for a very densely romantic work that reminds one little of Peer Gynt or the Piano Miniatures, which is what Grieg to my mind is most best at. Here he tries to fit himself into a Schumann-Brahms mould, and one with not very much airspace to breath in at that, to mix metaphors. Still, once you get used to the premises of the Finnissy reconstruction it is an impressive effort, rather remarkable in the way a composer of today can transport himself into a musical world so long past. And for that it is surely worthwhile hearing, even enjoying if you are attracted to that period. Ultimately it is the second, more Finnissian "Grieg-Quintettsatz" that makes a stronger impression, for he begins in a Griegian mode and gradually strays into less typical style, ultimately ending in a modern-postmodern vein that is increasingly of our time. I don't think the Quintettsatz would be as impactful without the initial Grieg reconstruction. Taken as a whole it is a journey that one rides along with and starts feeling a sense of relief once the curtains are pulled, the windows opened to let air into the stuffy Victorian parlor. In this way the process makes a total sort of musical sense. Chadwick and the Kreutzer Quintet do a fine job with the performances. Finnissy creates music that sticks with you, creates a sort of time travel that shows ingenuity, even brilliance. Is it "legit" to be doing this sort of thing? Of course. Why not? An impressive effort! 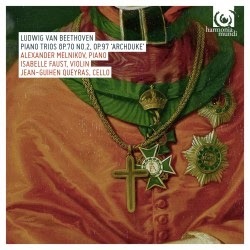 Isabelle Faust, Alexander Melnikov and Jean-Guihen Queyras, Beethoven, Piano Trios op.70 no.2 & op.97 "Archduke"
If you've lived long enough and listened long enough, music becomes filled with time and memory. There are two ways that can be the case. One is music that was in no way exceptional but brings to you in later hearing or in musical imagination the period of time as you experienced it. The second way is if the music is exceptional in itself, yet still has strong associations in time-memory for you. To me the wonderful piano trios by Beethoven have ramifications of the latter sort. It was the early seventies, I was trying to play jazz but also had ambitions to be a composer of some sort--both were of equal importance so I had a practice, work and play routine that reflected all of it. And then, of course, I listened closely to various music. It was the days of the 3-record Vox Boxes, where you could expose yourself to all manner of chamber music in respectable performances, 3 records for $5.99. Now keep in mind the rent for my one-bedroom in Boston was $125 a month. So it was cheap only in a relative sense. I found the Beethoven piano trios, complete in two Vox-Box volumes. I listened and was taken by the intricate three-way interplay and the wonderful lyric qualities that Beethoven was all about in many of these works. I had a girlfriend who was going to art school. We were on a kind of trial run in our relationship as was so often the case back then. She was over at my place and I was playing her some of the most lyric of the trios, gushing on about how great they were when all of a sudden, she gives me a look. I mean a look. It was sad and determined and puzzling all at the same time. What I found out later, thinking about it, was it meant "this guy is so crazy about this Beethoven that I couldn't imagine spending my life with him." Circumstances made that plain later and we parted. So the beautiful Beethoven trios call up this period to me, of loneliness, struggle to survive, and ill-fated relationships. The music is so good, though, that the transcendence to a place outside of time is easily made. Especially if the performances are phenomenal. Looking back, those Vox Boxes had very decent performances and blend was the primary way of proceeding; none of the three stepped out with some kind of individuality. At times the opposite is the case in the new recording of the last two trios I have before me today. As listed on the net or the catalogs it will probably read Piano Trios op.70 no.2 & op.97 "Archduke" (Harmonia Mundi 902125). Trios 6 & 7 in other words, written in 1808 and 1811, respectively. The press materials remind me (us) that Beethoven's trios gave the violin and cello equal parity with the piano and Ludwig was the first to do so. Yes, that's in part what makes them so utterly fascinating to hear. And in the hands of three Harmonia Mundi star soloists as we have on this recording, that becomes increasingly important. Isabelle Faust is on violin, Alexander Melnikov on piano and Jean-Guihen Queyras on cello. Melnikov plays a period piano, which gives the three-way interplay even more of an equality--as the composer meant for it to sound. Put all those factors together and set the players loose on these two very moving trios and you have something. With Faust, Melnikov and Queyras you have blending when it calls for it, but when somebody takes a lead or all three parts go in different directions contrapuntally, you have a marvelously stylized foregrounding effect. Certainly this isn't the first trio to have three heavyweights in it, but they are of our time also so the way they distinguish themselves is not by a sort of Gypsy pathos-bathos, the exaggerated gestures of neurotics, like some of the residual over-romanticists might have given out with last century. That has its place--but it is in the past, really. The post-Beethoven, pre-present. We get it. We don't need to be "harangued" by it. And in the present recording we are not. It's not a cold-fish interpretation, mind you. It has plenty of warmth. Just rightly sufficient, not exaggerated so that you lose the structural togetherness of the passages. Well, that is enough to give you an idea. Two of Beethoven's very best trios, showing phenomenal lyricism and ingenious part writing. Now I wont suggest you try this one on your potential partner as a litmus test, because you too might get one of those "weird looks" and find yourself very, very single! Or maybe this will cement the deal, so to say. Either way, don't blame the music, which is superlative, or the performances, which are phenomenal! The Necks make music that you would not expect a piano trio to make. I mean a piano trio in the jazz sense: piano (and keys), contrabass, and drums/percussion. They come from Australia, which explains none of it exactly. They have been doing what they have been doing for years now. 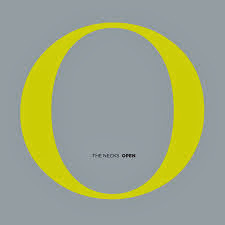 And what they are doing is well represented on their latest album Open (Northern Spy NSCD 047). It is one piece lasting 68 minutes. And it is a collective composition of the three members. It seems that, while they must have some idea of what they are going to do from piece-to-piece, improvisation plays a part, perhaps a large part in the music they make. Each album is different. All have trance minimalist/radical tonality qualities. Open is something about stillness, says bassist Lloyd Swanson. The entire piece has various sections, some very much into a sustained drone, some pulsate with a jazz-rock sort of inflection. Repeating motifs in the keys often punctuate the pulsation and they also appear in more static sections. But it's always about long sustains or mesmeric repetitions--and in a quite laid back way for this piece. Either way the Necks do some of their best work here. It has more of the cosmic, trance-inducing qualities of a Terry Riley than the matter-of-factness of Glass. And in every way you could call this modern classical, though you could also call it minimalist jazz-rock. It has that instrumentation, but otherwise this is performative rather than "jazzed"--not that such things make a huge difference on the listening level. The Necks set up some beautiful hypnotics on this one. With 67 solid minutes of unfolding sounds, you must listen patiently and let the sounds wash over you. This isn't music for those in a hurry to "get to it"! But if you give it time the music will work its way to you. You can't afford to be experiencing the music of today without hearing the Necks. And this is one of the very best. For music you don't expect, when you don't expect it, Chris Campbell can give it to you. And he does. Today I'm digging into his third album for Innova (860), Things You Already Know. I've review favorably the other two on the blogs. The third confirms what I already knew--that you have to chuck out the categories in his music, or create a new one with lots of hyphens. Call it progressive-classical-postminimal-rock-psychedelic-radical tonality? OK, that might cover it. What we get is a 33 minute quasi-suite of seven parts on vinyl or CD. The instrumentation includes strings, fuzz guitars, some kinds of junk percussion, and more. 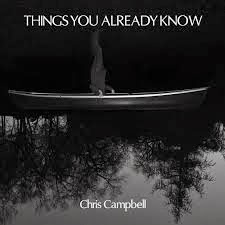 It has some of the repetition of progressive rock but structured and conflated with some drones, collaged combinations out of different sounds and styles, and a sure sense that this Maestro Chris Campbell knows where he is taking you. Things build up, then collapse into the next pathway to the next station, that in turn builds up and on from there. It has the feel of what we (who were around for it) heard in the more extreme psychedelics of the Beatles and other early prog experiments. Only there is more of it and the "it" has the unmistakable stance of a composer of talent. Nothing is quite random yet it feels much like open form when you are inside various parts. At times it is quite beautiful. At times it is quite bracing. It never sequences in ways you would expect. Make no mistake. This is new music. It is not old music. It captures the mysterious resonances of earlier rock at its most experimental and makes something complex and structured, bold and intrepid in where it goes and the lovely results it insists on providing your listening mind. Lyrical and cosmic--a combination that really appeals when it's done as well as Chris Campbell does it here. Get this one only if you want an adventure. But then latch on to your anchor or ballast! Excellent. Dmitri Kabalevsky (1904-1987), the forgotten man? Not precisely. During his lifetime he was a principal force in Russian music, did not manage to run afoul of things politically, and had a good deal of attention and performances showered upon him, relatively speaking. In the West he was certainly less known than some of his compatriots. I have no idea how his reputation fares in Russia today, but over here in New Jersey, where it is currently 7 degrees outside, if you were to find a man in the street and could slow him down long enough, he might tell you that he'd heard of Prokofiev or Stravinsky, but Kabalevsky? No. He was not the sort of musical personality that thrived on cutting-edge innovation. You might even say he had more of a conservative approach among composers of his day. And yet looking backward over the tumultuous 20th century we can finally perhaps leave behind the polemics of avant versus rear, "progress" versus standing in place. Partially because nobody won the contest for the artist of the future. Not really. And if you listen today to the music of Kabalevsky there is no mistaking it for the music of the 19th century. He was of his time as much as anybody. 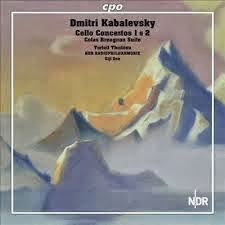 So we turn to the disk today, which features Kabalevsky's Cello Concertos 1 & 2 (CPO 777 668-2). The performances are very good. Torleif Thedeen takes on the solo cello role in a distinguished manner, neither overplaying or underplaying, giving the parts their lyrical and dramatic due with a beautiful tone. The NDR Radiophilharmonie Hanover sounds excellent under Eiji Oue. The concertos are first-rate. The first has that dramatic minor Russian feel especially; the second some of that and a bit more expressivity. They are works that deserve to be heard, masterful and well wrought. As a bonus we also get Kabalevsky's "Colas Breugnon Suite", which is perhaps his best known composition over the years in the States, or at least it has been for me since I found an old Columbia LP decades ago that featured the work on side two, backed by a well-loved Shostakovich symphony. It is captivating music, less ponderous perhaps but irresistible in the hands of NDR under Adrian Prabava. The cello concertos are a joy to experience as well executed as they are on this disk. You are well served by this release if you want to know why Kabalevsky deserves your attention. This has excellence. It is music that stays with you after the last bar. Bravo! The music of Weinberg (1919-1996) flourishes today. The number of releases devoted to his music certainly affirms that. I have reviewed a fair amount of them here, and I must say they have left me with a very high appreciation of his brilliance. So today we have another, this time devoted to his Symphony No. 12 "In memoriam D. Shostakovich" (Naxos 8.573085). The score was composed in 1976, some months after the death of his 32 year friend and close professional contemporary. The symphony, understandably, has a marked elegiac tone, a very palpable gravitas. The near hour-long work has a wealth of thematic material, a kind of endless unwinding of affective melody and modern harmonic richness. It also has at times a mysterioso sort of feel to it, perhaps a meditation on life and death? At any rate it ranks among his very best symphonies of the ones I have heard, with a bitter sort of beauty I am sure Shostakovich would have appreciated. The St Petersburg State Symphony Orchestra under Vladimir Lande do the score full justice, as they have done with some of Weinberg's other symphonies on Naxos. They strike an excellent balance between clarity and expressivity. 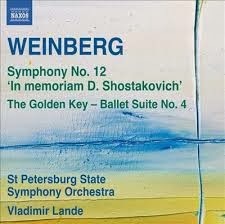 A bonus on this release is Weinberg's "Ballet Suite No. 4" from "The Golden Key", a somewhat lighter, less profound but thoroughly enjoyable score. The Lande recording of Weinberg's 12th is a great place to start exploring the many facets of the composer. It is a must (especially at the Naxos price) for anyone seeking a good appreciation of the mature, later period of Weinberg in the symphonic realm. I am certainly glad to have it. In the rather undifferentiated, blooming and buzzing confusion of the internet taken as a whole these days, getting attention is by no means as easy as it once seemed. 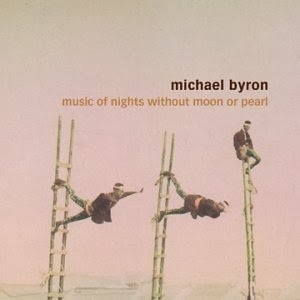 The composer Michael Byron is a good example. He is not exceptionally well-known out there and I hope my review will help more people to discover his music, because it deserves the public ear. My own private ears have been wrapped around his CD Awakening at the Inn of the Birds (Cold Blue 0012). It is a study in contrasts. Chamber music with more than one mood, five compositions are in the program, combining one or two pianos, synthesizer, a string quartet (the FLUX Quartet) and double bass. Not every instrument is used on every piece. And every work has a distinct identity. "Evaporated Pleasure" (2001) is for two pianos and has a sort of diatonic turbulence of jagged-edged bursts of sound entering abruptly in short sequences which when combined with complementing bursts create a kind of whirlwind effect. The title cut "Awakening at the Inn of the Birds" (2001) has a similar objective, only it is for the strings. You realize that it has the sort of total cacophony that a full contingent of birds may get with a collage of calls going simultaneously at dawn in the spring. Neither of these works have any dissonance involved but they manage through their irregularity to sound modern in a sort of ambient post-minimal way. The latter piece is much denser because especially of the strings and their multiple-stop capabilities that Byron takes advantage of. It is more frenzied, too, in an organic kind of way with rapidly articulated phrases that intermingle and interpenetrate. There are repetitions (in a sense like different bird calls) that meld together so that it's not the individual motifs that stand out as much as the entire collectivity. "As She Sleeps" (2000) is a dynamically contrasting solo piano meditation on a lovely chordal progression that strikes one as having some relationship to Satie in a lyrically mystical mood. It is a fitting end to this disk and groups in some ways with the first two compositions on the program, "Continents of City and Love" (2001) and "Tidal" (1981), both of which are beautiful in a relatively placid manner. "Continents" features nicely paced, slow moving chordal forms in the strings that are punctuated by foregrounded piano figures that break through the sustained beauty with more percussive but related diatonics. "Tidal" has a similar trajectory only the two-piano interplay is much busier with repeated arpeggiations and melodic cascades played atop a lovely set of slowly moving and sometimes static chordal drones. I must say it all appeals to my sensibilities. There is beauty and a sort of quiescence-to-turbulence-to-quiescence arc to the entire sequence that pleases and brings one on a kind of musical journey. Based on this disk it is clear that Michael Byron is another talented voice in Cold Blue's presentation of "radical tonality". His music is neither neo-classic, neo-romantic, neo-modern or quite minimalist either. It straddles the fence and by so doing creates music of our present, music that might not have been possible 50 years ago because we would not have been prepared for it. 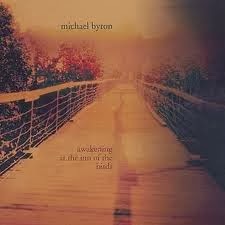 We are now and Michael Byron gives us his own window into the possibilities, and a fine program too. Recommended. Contemporary music for harp and cello? The duo Couloir gives us some rather fine listening in this vein. These are two well-prepared Vancouver based artists--Heidi Krutzen (harp) and Ariel Barnes (cello). 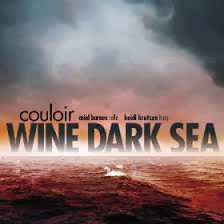 Wine Dark Sea (Ravello 7879) is a disk exploring three interesting works by three contemporary composers. All three works have a sort of post-impressionist, sometimes almost Satie-esque rhapsodic ambiance which the duo plays with great resonance and impeccable style. The pieces involved are Jocelyn Morlock's "Three Meditations on Light", Baljinder Sekhon's "Drifting Seeds", and Glenn Buhr's "A monk, dancing". I will not go into a blow-by-blow description. They flow together and work so well as a kind of triptych that you should hear the three as a whole. That was my experience. The works have substance to them and the cello and harp performances are quite beautiful and fitting for the music at hand. The importance of Gyorgy Ligeti looms ever larger in my mind as one of the heroic champions of later High Modernism. He was a composer with a keen dramatic sense and no matter what he set himself to do, he managed to triumph. The Quatuor Bela has given us a volume of prime Ligeti in their Metamorphoses nocturnes (Aeon 1332). I've been listening closely. It's a program of Ligeti's String Quartets: No. 1 (1953-43) and No. 2 (1968), and then his "Sonata for Cello" (1948-1953). All the works have been recorded before, naturally. I reviewed the Keller Quartett versions of the quartets here last August 26. I found their versions bracing, but then I find the Quatuor Bela versions no less so. These are high watermarks in the quartet repertoire, following upon Bartok's masterful six and prefiguring those of Elliott Carter. 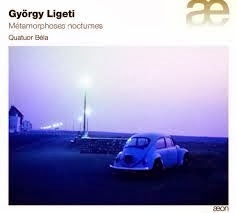 The subtitle of the first quartet is "Metamorphosis nocturnes", which explains the title of the program but also rather puts Ligeti's chamber work here in perspective. I am not the one, especially in this setting, to give you a thematic analysis of what happens with the melodic-harmonic materials in these pieces, but transformation is virtually continuous. High Modern music often can be thought of as variations on variations, but true also would be the idea of transformations of transformations, with the right composer. Ligeti is a primary example. Both quartets have moments of raging fury, of temporal explosions, of dynamic diremptions followed by quieter reflections or sensory-motor energy modules. And yet with enough listens you feel that there is a kind of inevitability of the movements from x to y and that is certainly part of the brilliance of these works. Quatuor Bela tackle it all with a kind of all-around sequencing that makes a convincing whole out of the parts. A most definite bonus on the disc is the two-movement Sonata for Cello (1948-1953) taken in a definitive way by Luc Dedreuil of the quartet. There are more conventionally concerted moments, albeit in High Modern garb, than you hear in the quartets. And yet the expressive fire and logic of sequence comes through here as well. Needless to say these three works are a critical part of the 20th century chamber music heritage. It is nice to have such stirring performances on one program. Bravo! The world of international competitions is as far removed from me right now as another world is close, the world of a major ice and snow storm, which is happening outside my window in New Jersey as I type this. If there was a competition I had to attend today it would be out of the question that I could get there, or anywhere else for that matter. Yet the beauty of the outside scenario--the continuing sleet, the natural and man-made landscape as an ice sculpture in the making, complements what I play for a last listen as I review it--that is Ukranian pianist Vadym Kholodenko's Gold Medal winning performance from the Van Cliburn International Competition of 2012 (Harmonia Mundi 907605). So though I may be far removed from such things physically this morning, the music is very near. The CD covers Kholodenko's performances of Stravinsky's Trois Mouvements de Petrouchka and the 12 movements from Liszt's Transcendental Etudes. And judging from this spectacular disk, they chose very well indeed. 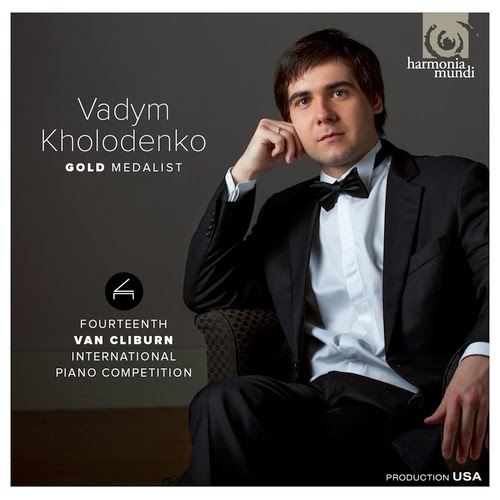 Kholodenko in every way fits the bill of a thrilling virtuoso pianist in the Van Cliburn tradition. He shows us the Transcendental Etudes in all their symphonic pyrotechnical glory. And then, my special favorite, he puts us into Stravinsky's effervescent world of Petrouchka (in the solo piano version) with rousing spirit. Here is a pianist of phenomenal technique recording live, without a safety net, at the very recital that helped catapult him into world virtuoso stardom--in incredible detail, with superb dynamism, beautiful energy and zest. It is one of those experiences one no doubt would not forget if he or she was there. We have the next best thing, front row seats to a virtual recreation of the performance that we can experience as many times as we like. Of all the pre-modern composers for the piano, certainly Franz Liszt would be towards the top for the vast creative resources needed to perform many of his works satisfyingly. The phrasing, use of pedals, rubato, the general articulation, all can be complex and can demand a real poet of the pianoforte to make the music as brilliant and exciting as it was meant to be. 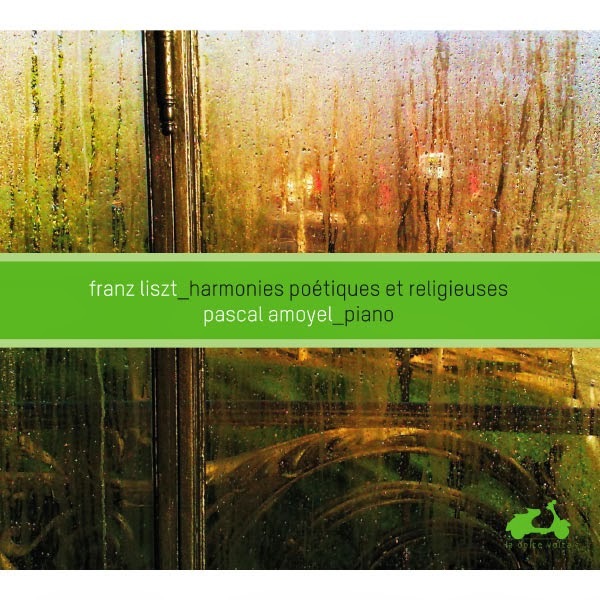 Pascal Amoyel is just that pianist, as he shows on his 2-CD set of Liszt's works, Harmonies poétiques et religieuses (la dolce volta 107.8). The set was recorded in 2006 and has been reissued for our appreciation. We tackled Amoyel's Charles Alkan set last year (see search box above) and found his interpretations irresistible. Not surprisingly, he is equally masterful with this set of Liszt. The works here are some of the most poetically demanding, not the least the title works "Harmonies poétiques et religieuses", but also "Liebestraum" and the "Ballade No. 2", among others. Amoyel comes through with expressive magic. Technique is ever harnassed to Liszt's musical voice. Amoyel's rubato accentuates the striking beauty of the music rather than sounding like someone gasping for air with over-emotion. Amoyel lingers where he feels, is in no hurry to get through, gives the cascading musical evocations their due weight, in short gives us as imaginative and stirringly lucid a performance of these pieces as we are likely to hear today. Amoyel creates a Franz Liszt not mawkishly overwrought, but rather thoughtfully profound, which surely is how Liszt conceived of it all. This set is a marvel. Up until now when I thought of recorders, I thought of the baroque and early music periods and the sound one hears in such contexts. It never occurred to me that the high modern arena would utilize the family of instruments and I cannot recall having heard such a thing. But all that is in the past now that I have immersed myself in Axel Borup-Jorgensen's CD Recorder Music (OUR Recordings 8.226910). We are treated to eight compositions for various-sized recorders--alone, with harpsichord or with percussion. No less than seven of these works are enjoying their world premier recordings on this disk. The recorder performances are in the hands of Michala Petri and Elisabet Selin, and they are impressive exponents indeed. Ingrid Myrhoj appears on harpsichord for two pieces; Gert Mortensen plays the multiple percussion instrument part on the one work involved. Everyone sounds great but it is the expanded recorder techniques and the clarity, dynamic thrust and elan of their execution that bring it all together. Alex Borup-Jorgensen (1924-2012) wrote these works between 1975 and 2011. That they were a labor of love seems clear as you listen. The mastering of the recorder parts by Michala Petri and Elizabet Selin were no doubt labors of love as well. The earlier works feature rapid-fire jumps into and out of various registers; the later works less so. In any case the parts are difficult and superbly played. It's almost uncanny to hear the recorder in an expanded, ultra-modern tonality. Once one gets over the shock the idea that these are fine works that bear repeated hearings sets in. And from that point I was hooked. This is not just state-of-the-art modern recorder music. It is also a collection of very pleasing high-modern chamber music.